Presenting a collection of Miscellaneous Dining furniture. We gave it this name because the items are difficult to easily fit into one of the traditional categories. 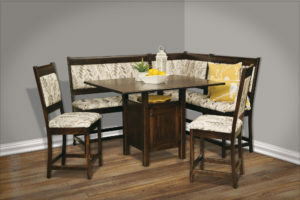 Yet, among this lineup of Amish made dining room furniture, you’ll find items that you don’t want to do without! For example, no upscale kitchen or pantry should be without a wooden bread box or trash bin. Or wine cabinets and wall hangings. Also, check out the storage cabinets and shelving. Plus the cool breakfast nooks. So browse our sizable online collection of miscellaneous Amish furniture. Or, visit our ‘brick and mortar’ store in Shipshewana, Indiana. 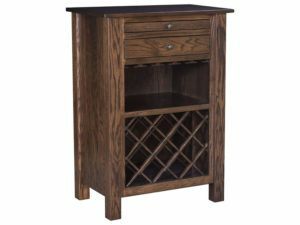 The collection of Miscellaneous Dining furniture from Weaver Furniture Sales brings the beauty and durability of solid hardwood furniture to a practical level in your pantry or dining room. And this is because top Midwestern Amish craftsmen custom build each piece. And they use solid regional hardwoods. Plus skills handed down from their ancestors. So the can’t-live-with-‘em Miscellaneous Dining pieces you choose should last for decades to come. Even becoming a family heirloom.